For the past two decades, Qing Huo Liu has been working at Duke Engineering to solve computational problems dealing with complex wave fields ranging from electromagnetic to seismic. With a proven method for analyzing these types of data, he has impacted numerous industries including electronics, airplanes and petroleum. Electromagnetic fields pervade the modern world around us. Every electrical system big and small creates its own field, which leads to a complex pattern of interactions. Most of the time these fields aren’t worth worrying about. But in some applications where the systems are extremely sensitive or close together, their details are absolutely crucial, and it’s Liu’s job to help model and understand them. “If you want an aircraft to have a small signature from radar, you have to model how electromagnetic waves interact with the large structure,” said Liu, professor of electrical and computer engineering at Duke. A classic approach to modeling an airplane’s electromagnetics is to break the problem down into small pieces, calculate the field inside each, and add them all back together. This approach, however, requires far too much computational power to perform efficiently. Liu’s contribution has been to develop “spectral” computational methods that take into account a better understanding of electromagnetic fields. This allows the model to use a larger grid, greatly reducing the complexity of the resulting calculations. While this works well for large-scale problems, different mathematics is required for modeling smaller devices, such as the airplane’s antenna. For understanding how best to integrate tiny but critical components such as this, Liu has developed “multiscale” computational methods that manage to combine the different approaches needed for the different scales. Another industry that requires a rock-solid understanding of electromagnetic fields is computing. With so many electrical components operating in a confined space, their electromagnetic fields are bound to affect one another. Liu has teamed with industry partners such as Intel on these issues to help optimize the electrical performance of integrated systems. 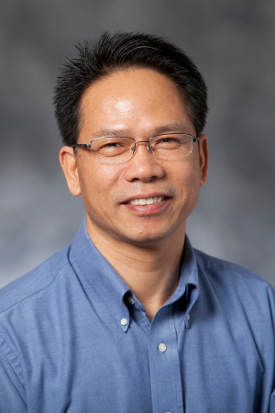 It’s work that won him the 2011 IEEE Transactions on Components, Packaging and Manufacturing Technology Best Paper Award. The utility of Liu’s approaches doesn’t end with electromagnetics. It can be applied to most any situation where waves can propagate—even the Earth’s crust. The majority of Liu’s current research focuses on modeling how waves travel through the ground to help the oil and gas industries image and locate potential reserves for extraction. This requires combining knowledge of how electromagnetic waves and acoustic waves travel through the complex ground we stand on with other geological concepts such as fluid flow. Speaking of the human body, Liu also works with microwaves, optics and ultrasound to help create medical images. While it’s a different type of math with its own challenges, Liu says the ideas behind the underlying algorithms remain the same.